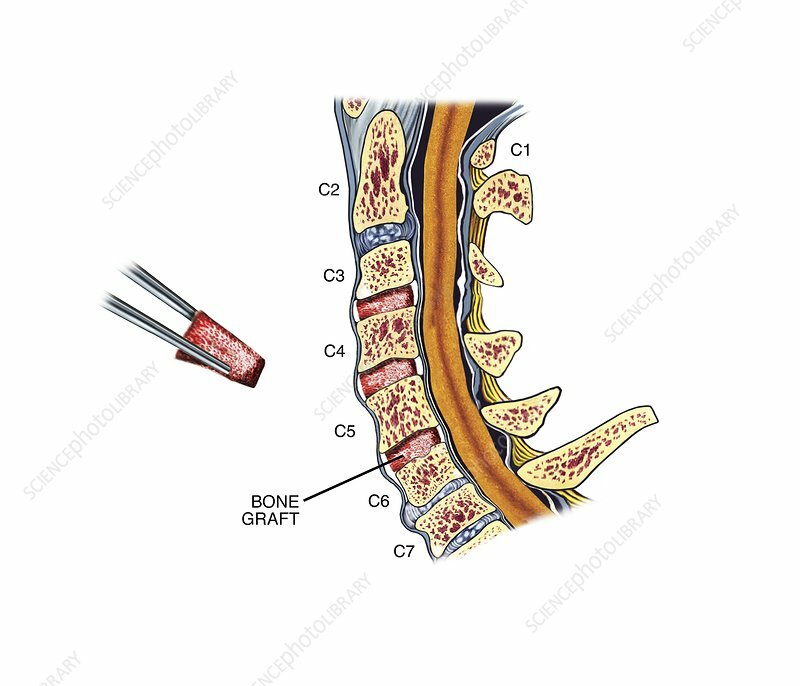 Bone graft to restore cervical spine. Labelled artwork showing a sagittal view of wedge-shaped bone grafts (red) being placed in a patient's cervical (neck) spine to restore the normal inward curvature (lordosis). Between each vertebra are discs of fibrocartilage, forming joints that allow the spine to bend. These bone grafts are from a cadaver (dead body). All seven cervical vertebrae are shown here (C1 to C7), with the grafts in the C3-C4, C4-C5 and C5-C6 joints. The spinal discs in the C6-C7 and C7-T1 joints are narrowed, indicating progressive collapse of the spine. The specialised vertebrae connecting to the skull are the atlas (C1) and axis (C2).